Henry Holt and Co. (BYR), 9781627790161, 32pp. 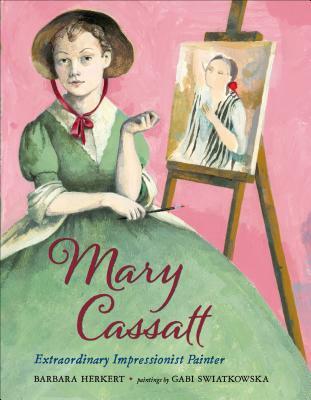 Mary Cassatt was a headstrong, determined girl. She wanted to be an artist in 1860, a time when proper girls certainly weren't artists. It wasn't polite. But Mary herself wasn't polite. She pursued art with a passion, moving to Paris to study, painting what she saw. Her work was rejected by the Salon judges time and time again. One day, the great painter Edgar Degas invited her to join him and his group of independent artists, those who flouted the rules and painted as they pleased—the Impressionists. Mary was on her way. "I began to live," said Mary. Today, her paintings hang in museums around the world and she is recognized as one of the most celebrated female artists of all time. If you’re born on this planet, you’re set for a colorful life, whether you want it or not. I found myself in Eastern Europe, in southern Poland, in a little village with a weird name. I don’t remember making that decision. The first thing I remember are the crows. Crows are to Poland what ravens are to London. The crows would hold daily conferences right in front of my house, spreading their black selves like a carpet over the grassy field. I’d run up to them and watch them rise like a shimmering giant, watch the sky swallow them up. I wrote stories until it was decided that there was too much kissing going on—in the stories, of course, not in real life. I was forbidden to write any more. I drew pictures, of princesses mostly. As there were no objections, I kept at it all through elementary school, gymnasium, college, and right into my professional life. While at elementary school, I really did believe I was a princess. Not the Disney kind, but one more along the lines of a Russian folktale, the princess lost and never found, waiting patiently for the day it was officially announced. I entered the Lyceum of Art at fourteen and discovered it was full of princesses, as well as knights. Sometime around the third year of school it dawned on me that if I was the “lost and never found” kind of princess, there was no use waiting for the official announcement. So I climbed on top of my wardrobe to take a look at things from a different perspective and decided it was time to go to America. I took my dog with me. My dog was very fond of eating toilet paper, and since we had no such commodity in Poland at the time, I figured he’d do better in America. Plus, I couldn’t bear to leave him behind. Gabi Swiatkowska was born in Tychy, Poland, and attended the Lyceum of Art in Bielsko-Biala, as well as the Cooper Union School of Art in New York City. She lives in Brooklyn, New York.